Learn the fundamentals of digital citizenship through our award-winning, animated, choose-your-own-path interactive experiences, designed for grades 6-8. Invite students to explore digital dilemmas, make good (and not-so-good) decisions, and try out possible solutions through stories and mini-games – all without risking their real-world reputations. Discover how Common Sense Education’s award-winning digital literacy and citizenship curriculum seamlessly integrates into blended-learning environments. Students can earn badges for completing each section! Get our student badges here. Curious to see what Digital Compass looks like in action? Check out this video to see how one educator uses Digital Compass in his classroom to onboard students. Which devices does Digital Compass work with? Digital Compass is available on the web, Edmodo, Android mobile and tablet app via Google Play for Education as well as iTunes for the iOS mobile and tablet app. The web version will require Internet access, but once downloaded, the app versions do not need a connection to the Internet. How long does Digital Compass take? Each story takes a minimum of 45 minutes; so 8 stories x 45 minutes = 6 hours. Each story has 9 endings, 23 decisions, and 32 paths, which makes for a total of 50 possible combinations! Each story also includes a skills-based mini-game. How do you suggest a blended learning approach? 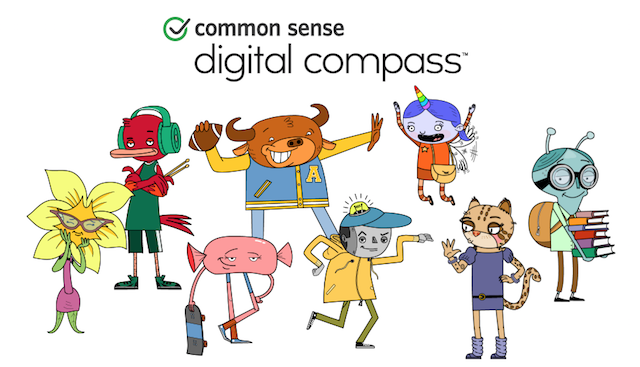 You can use Digital Compass to onboard students to digital citizenship, and then follow up with one of our teacher-led K-12 Digital Literacy & Citizenship 45-minute lessons. Consider using a flipped classroom model to maximize time with your students. There are tips for implementation in the Quick Start Guide. You can also watch this archived webinar to learn more about implementation options. Why are students playing through a character (avatar) and experimenting with negative as well as positive outcomes? We relied on current game design research to help aligned our ideas with the developmental needs of children in grades 6-9. Take a look at the synopsis Dr. Michael Carter outlined for us, located in Appendix A in our Educator Guide. Can I use Digital Compass as a means of assessment? There are three forms of assessment within Digital Compass. The scorecard, which can be exported, reports a percentage score for a student’s progress within a story. Additionally it records the first, last, and best score and time from the embedded mini-game. Yet to get at students’ qualitative learning, we also suggest reflective and creative writing prompts (see Appendix B & C in the Educators Guide). Lastly, if you teach a unit of lessons in conjunction with Digital Compass, you can have students take the interactive unit assessment. Can students earn badges through game play? Common Sense Education thanks these generous sponsors for supporting the development of Digital Compass.